It is very difficult, or rather nigh on impossible to think of a reason that anyone would not want this attractively packaged 6 CD box set, unless of course you own all eleven of the original albums that go to make up this package. 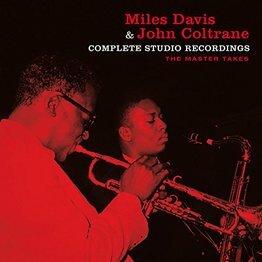 Capturing all of the studio master takes with Miles and Coltrane between 1955 and 1961 this covers all the important recordings made by this stellar frontline partnership, the likes of which have never been heard since. Throughout, it is possible to hear how Miles’ was to nurture the raw talent of Trane into the giant of the tenor saxophone that still leaves many people reeling nearly 50 years after his death; and also how the trumpeter would take charge of his own destiny, having rid himself of his own demons, and lead one of the most important and influential small groups of the decade. This time frame also spans Davis’ work for both the Prestige label and his work for Columbia Records who were anxious to sign the trumpeter after his appearance at the 1955 Newport Jazz Festival. Therefore, all of the classic quintet albums recorded over two days in May and October 1956, Workin’, Cookin’, Relaxin’ and Steamin’ are present in their entirety, along with the oft forgotten Miles: The New Miles Davis Quintet. Taken as a whole these are a remarkable series of albums, and for my money over shadow the trumpeter’s debut for his new label, Round Midnight. All the material is presented in chronological order unlike the original albums, and it is fascinating to hear how the quintet was to develop over time. As if this was not enough we also have the two classic sextet albums, Milestones and Kind Of Blue that complete the picture of a creative span that is quite like any other. The set is made of two incomplete albums, Jazz Tracks that is a bit of a hotch potch, previously released as a complete LP using material by the sextet along with Miles’s core for Louis Malle’s film Ascenseur pour l’Echafaud that did not feature Coltrane, and the two titles from Someday My Prince Will Come when Coltrane replaced tenorist Hank Mobley on the last recordings that Miles and Trane would make together. With a comprehensive 40 page booklet that contains the original artwork and LP liner notes this is a highly desirable box set that is ideal for newcomers to the Miles or those looking to plug the gaps in their collection.